Hibernation Supplies - Are You Finished Yet? Oh joy. Rapture. Winter is upon us. Our first dose of snow hit us over the weekend, so I guess Fall has officially packed it in for 2014. Christmas has obnoxiously butted its way in front of Thanksgiving, and once again, my children are ill-prepared in the area of winter weather attire. (When will I learn and just buy freaking snow boots as soon as they hit Target’s shelves?) Thankfully, my son’s Kindergarten teacher was ahead of the game and started getting her students into a chilly mindset. 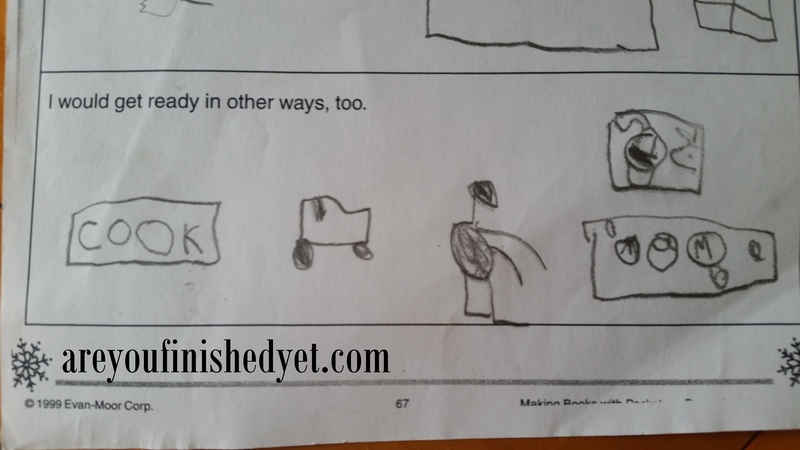 The other day, Michael came home with a worksheet about hibernation, and he had to draw pictures of things he would take with him if he had to hide himself away for a warm winter’s nap, just like a bear. Let me provide you with some captions. A cookbook, a monster truck, a zombie doll, a photo of Santa and his reindeer, and some M&Ms. Aside from being a tad hurt that my son would rather stare at a picture of jolly old St. Nick than his dear, sweet mother, I’d say he has a pretty well-balanced list of necessities and comforts. Although, I doubt he would actually use the cookbook. I feel confident he already knows the recipe for peanut butter and Nutella sandwiches, which is all he is likely to eat. As I look out at the snowy rooftop of my neighbor’s house, I wonder what I would bring into hibernation. #1 My crock pot. Nothing says, “I’m checking out for a couple of months,” like no-fuss cooking. Throw in a bunch of stuff you like, turn it on, go to sleep, then nibble on the warm goodness at your leisure. Gourmet for the lazy. #2 My space heater. Let me not mince words here: I. Abhorrently. Despise. Being. Cold. It’s why I own a knockoff Snuggie. #3 The world’s longest extension cord. Because otherwise, #1 and #2 would just be dumb. This is what you call forward thinking…which I apparently can only do when it comes to my own comforts and not when it concerns my kids having snow boots. So, that pretty much covers it. I think I would be in for a pretty nice hibernation, if I do say so myself. But I’m curious…what would YOU take into hibernation? Be forewarned. If you say a picture of Santa instead of me, I might start getting a complex. Want to stay updated on what is happening with Absolute Mayhem? Please like my new Author Facebook Page! I couldn’t agree more with you about winter and the cold! NYC is frigid this morning! I’m chilly just thinking about it! Stay warm! Great read.Love the plug in! Originally from the north i know the cold well, here in Florida it was a brisk 48 degrees and I have to say I would bring with me my ICE CREAM CLOTHS ( sweat pants and shirt booties and a winter jacket) , Hot coffee, and holiday music. Aww but Santa brings presents lol! I would for sure have a pic of my kids, actually the whole immediate family, my laptop (and extension cord) and lots and lots of carbohydrates as well as frequent delivery from Hunan Yu!! Let me know when Hunan Yu shows up and I’m going to come visit your cave. You’re a lefty! I didn’t know that!! My hibernation list would depend on where I’m hibernating, I think. Don’t keep me waiting too long. I’m on pins and needles. Thanks. I’m sure it is just the beginning of more to come! Down comforter, lots of pillows, ear plugs, smartphone and solar charger with a loooong connector to the smartphone. I don’t care if I have service or not, I just want to play candy crush. That sounds like a cave I’d like to hang in. And it might actually be nice not to have connection for a couple months. I bet Candy Crush would be your beeyatch come Spring. I would definitely bring everything I have on DVR cue, comfort foods,soft fleece blanket and fleece robe too! And of course it would be nice to hibernate with baby Ryann for lots of snuggles!!! i would take a decent lamp into hibernation so that I could see to read! otherwise i will be one cranky bear! They are so selfish like that 🙂 Good call on the puppy! My mom. That’s all I’ll probably need. She makes the BEST nutella sandwiches. 😀 When Michael’s older, I’m sure he’ll invite you to his cave too! Atleast for those sandwiches. LOVE #3!! Can’t wait to see the book! I got stuck with Thanksgiving tablecloths for my sons preschool Thanksgiving party next week. Well, let me tell you, it’s might be easier to find the worlds longest extension cord. Christmas has practically wiped out Thanksgiving’s existence. Therefore, I’d bring a pen and paper into hibernation and I would write awesome Thanksgiving songs so Thanksgiving can be acknowledged in the stores playlist. You should totally do that. I always felt like we needed some good Thanksgiving songs, because I for one LOVE Thanksgiving. Can I request a song just about stuffing? Good luck with the tablecloths!